The Submariner is one of Rolex’s most successful and coveted lines of watches, and nearly every vintage Submariner reference is now highly sought-after by collectors. Many people consider the reference 6538 to be the number one vintage Submariner to own; however there is another “big crown” Submariner that pre-dates the reference 6538, and is arguably one of the most unique and important vintage Submariner references of all time. Rolex first introduced the Submariner in 1953 with the reference 6204. Although this reference marked Rolex’s entry into the newly founded, dive watch market, it more-or-less followed the same design as Rolex’s existing, Turn-O-Graph line of timepieces. As such, the reference 6204 was fitted with a standard-sized crown and “pencil-style” hands, and was given an official depth rating of 100 meters. Slightly less than a year after the Submariner was first announced, Rolex released two additional versions of their revolutionary dive watch in the form of the reference 6205 and the reference 6200. The reference 6205 was almost identical to the reference 6204; however the reference 6200 was a significantly different timepiece, both inside and out. 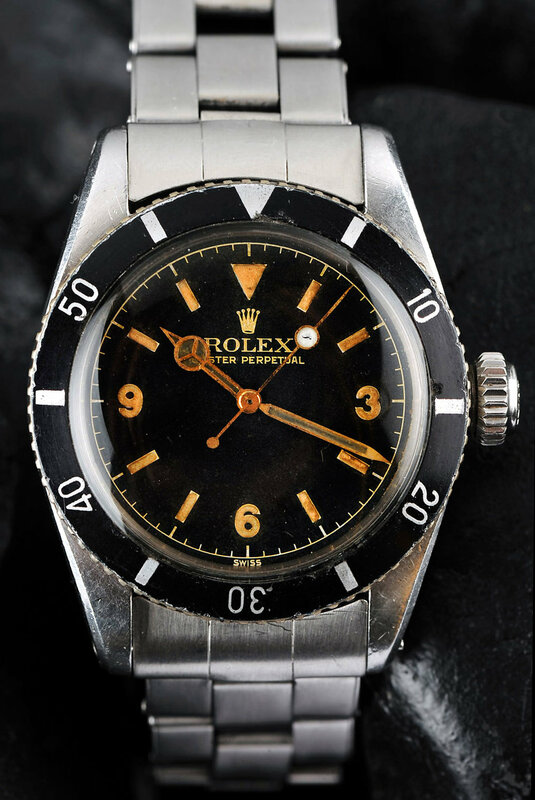 While the reference 6204 and 6205 closely followed the design of Rolex’s reference 6202 Turn-O-Graph, the reference 6200 used a thicker case, and larger, 8mm winding crown, making it the oldest reference among the three vintage “Big Crown” Submariners that are now so highly sought after by collectors today. The thicker case and larger winding crown allowed the reference 6200 to have a depth rating of 200 meters, which was twice that of Rolex’s other two Submariner references of the time. Internally, the reference 6200 was fitted with Rolex’s A296 movement, while the reference 6204 and 6205 received the A260 movement. Both calibers had identical functions (time-only plus running seconds), and while it cannot be said that one movement was definitively better or more advanced than the other, the A296 was slightly larger and more appropriately sized for the reference 6200’s thicker case. Much like its reference 6204 and 6205 brethren, the reference 6200 only remained in production for roughly one year, during which time it is estimated that only a few hundred examples were manufactured. However, unlike many other vintage Submariner references, the vast majority of reference 6200 watches look largely the same; there isn’t nearly the same degree of variation that exists among other vintage Submariner references. Along with its oversized winding crown, the most noteworthy features of the reference 6200 are its “Explorer-style” gilt dial, and bezel insert that completely lacks individual demarcations between its 5-minute markings. Additionally, subtle variations exist among the dials fitted to different examples of reference 6200 watches. The size of the Rolex logo and text can differ, and some examples have the “Submariner” name printed on them, while others do not. Most interestingly, despite their increased depth rating, no reference 6200 watches make any mention of it on their dials. Additionally, the reference 6200 was the very first Submariner to be uniformly fitted with “Mercedes-style” hands – a trait that has since become standard across all of Rolex’s dive watches. Examples of both the reference 6204 and the reference 6205 can be found with the earlier style of “pencil” hands; however all reference 6200 watches originally received “Mercedes” hands that are (interestingly enough) slightly longer than those fitted to all subsequent Submariner references. Although the reference 6538 gets a lot of attention for being the same watch that was worn by Sean Connery in the very first James Bond film, the reference 6200 is the very first “Big Crown” Submariner, and a true grail watch for serious collectors. Due to its Explorer-style dial and non-demarcated bezel insert, the reference 6200 has an appearance that almost resembles a vintage Blancpain Fifty Fathoms, which makes it visually distinct among the various “pre-crown guard” Submariner references. Given their limited production numbers and extremely early place within Rolex’s dive watch history, the average price of a reference 6200 Submariner now sits well above the six-figure point, and it is easily one of the most rare and desirable Submariner references of all time.